...in this case the Macarena. We decided to swap around our activities again... team games (football, obviously! 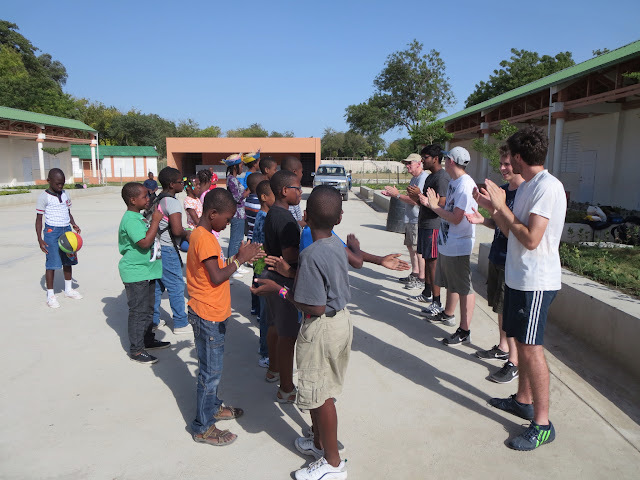 They are the most football mad of any youngsters we've come across on any Team Win trip) on the pitch in the morning followed by card games and smaller group games, then arts and crafts in the afternoon and more bat and ball games for those who could brave the heat. The view across the playing fields at St. Louis de Gonzague primary school, Delmas. Bookmarks that became head dresses. 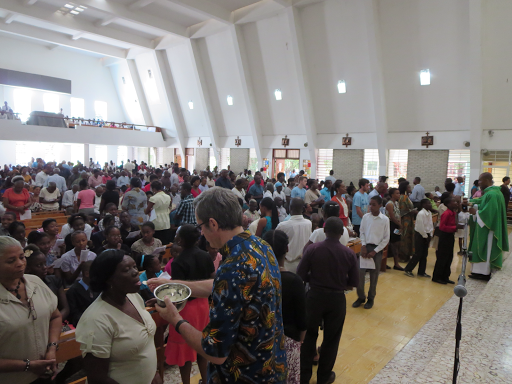 On Sunday morning we attended a packed Mass in the chapel of St. Louis de Gonzague school. Many of our children from the camp joined us, a few as altar servers. Aaron and myself got involved in the music liturgy, leading 2 worship songs (I Will Worship + Lord I Lift Your Name On High) for the Offertory and after Communion respectively and the Lamb of God. Sunday lunch saw us profiting from the purchases made at the beach the day before: fresh crab + fish. 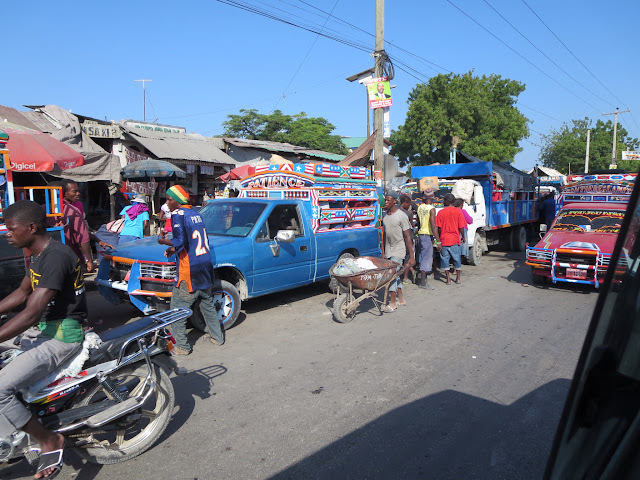 ... including a visit to the ruins of Fort Jacques, a 200 year-old fort that was built just after Haiti one its independence from France to guard against any possible further colonial invasion. Day 5 in Haiti... a day at a private beach 50 miles to the north (paid for by our group, the beach is attached to a property owned by a former pupil of the Brothers in Haiti). For most of the Haitian children it was their first time on a proper beach where it was safe for them (and us) to go for a bit of a swim (with me as lifeguard). We were joined by the five Haitian Novice Brothers (first year of training to be a Brother) who will be making their first vows in a couple of weeks. A bit of bartering with some local fishermen and before we knew it we were bringing 5 fish + 2 large crabs back with us. On day 4 we decided to use a different strategy with the children and start with the team games (basketball, in particular) in a partly shaded playground area of the secondary school part of the campus, the idea being to then do the arts and crafts activities at the start of the afternoon... activities more conducive to good digestion and more suitable for the peak heat of the day. 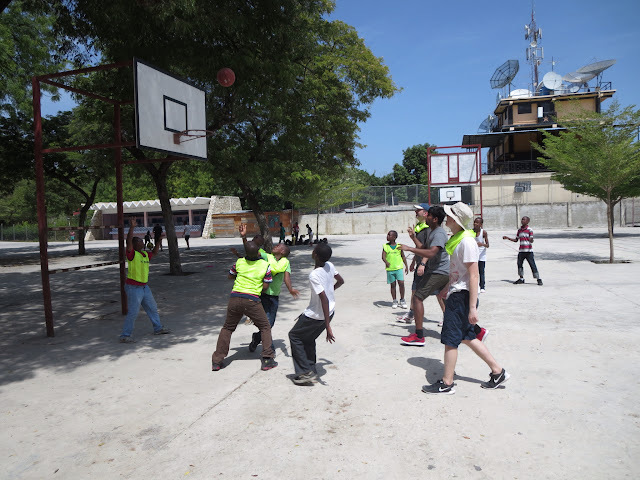 However, we did not count with the young Haitians pestering us to have another full size football match in the afternoon once the craft activities were finished (today paper aeroplanes). However, our young Scousers found this second match in 2 days much easier to cope with heat-wise, their bodies probably getting more used to the heat and humidity. Good use was then made of a tap, a hosepipe and a bucket to cool everyone down. This was our first day of activities with the 25-30 or so primary school pupils aged 11-12 years who had been invited by Bro. Lamy (until this summer the Head of our primary school here in Delmas) to take part in our mini-camp. Our first impressions that day have been confirmed on the subsequent days: they are very polite, friendly and delighted that we have come to spend some time with them. There are also some real characters among them (Gabriel aka "Messi", Alex, Brian, Youri, "Donald Duck", etc...). They seemingly love all types of sport and take the matches of football and basketball VERY seriously. 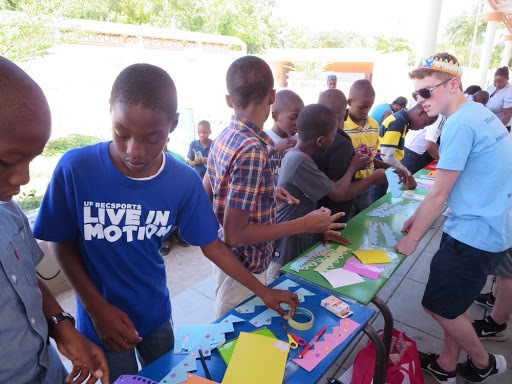 They have also got wholeheartedly involved in our arts and crafts activities and picked up our dance routines quickly and enthusiastically (YMCA, I Am A Music Man...). Here are some photos from Thurs. 23rd's activities. Before long our teens were being challenged to a sprint.